In this review, you can read about the various attributes of Rene Furterer Paris Vitalfan Thinning Hair, a dietary supplement for the treatment of hair loss. The product is filled with citrus extracts which contain valuable bioflavonoids, substances which are essential for the healthy and quick growth of the hair. Rene Furterer Paris Vitalfan Thinning Hair provides the body with the vitamins and nutrients necessary for strong hair, which grows swiftly. To find out more about the advantages and short comings of Rene Furterer Paris Vitalfan Thinning Hair, then keep on reading this review. Here we can see the various natural ingredients which seek to make Rene Furterer Paris Vitalfan Thinning Hair and optimal supplement for the treatment of hair loss and thinning. The inclusion of Biotin and Zinc are directly related to increasing the strength of the individual hair strands, as well as ensuring their health. The various herbal and floral extracts found in Rene Furterer Paris Vitalfan Thinning Hair work towards increasing the speed at which the hair is grown. However, something that immediately leaps out is the inclusion of artificial coloring and flavors, which add to the uncertainty related to potential side effects. One container of Rene Furterer Paris Vitalfan Thinning Hair contaning 30 pills, which is a spply enough fro a month, is valued at the market price of $42, which makes it one of the more expensive products of its kind on the market. After using Rene Furterer Paris Vitalfan Thinning Hair for two months, I have found that this particular product is lagging behind the opposition with barely noticeable effects following the end of the two treatments. Note that the manufacturer states that a single month of use should be enough to see the effect of the product. In the end, there was a small increase in speed of growth, and the process of hair loss did slow down, hoever these changes were superficial at best. Women pregnant and nursing should steer clear of Rene Furterer Paris Vitalfan Thinning Hair, and the artificial ingredients should keep any user on their toes. The manufacturer is offering a full 30 day money back guarantee in the case of any customer dissatisfaction. 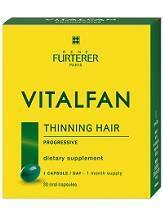 While Rene Furterer Paris Vitalfan Thinning Hair is covered by a reassuring guarantee, and the inclusion of citrus extracts is something you won’t readily find in other products, the high price and unfortunate inclusion of artificial ingredients, coupled with a sub par performance force us to warn you against this product.